Mini-Donkeys love you the minute you touch them, after they are born. Once you have made that contact, they are instantly bonded, always eager to please and always happy to see you. They crave human attention, and are friendly to all who come in contact with them. They have the best personality of any animal we have ever come to meet. They are Loyal, Protective and Territorial, much like a dog is. They are also a herd animal and do not do well alone, they need another donkey friend.They do not make good companions to smaller animals, due to the fact that they play differently. Because of this the smaller animal end up getting hurt. We are always asked this question. Well first of all we think that they just make wonderful pets. 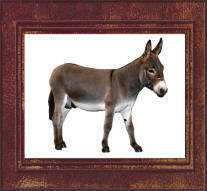 But you can also pack with them, they can carry about 60#, depending on the size of your mature donkey. Anyone under 60# can ride them, They really do not have to be broke like a horse, they are happy to give you a ride, even the first time. You can also train them to pull a cart, and they can handle about 400# if you have a well balanced cart with the right kind of harness. They are always a big hit in parades and petting zoos. Some people will tell you that equines do not need shelter, but would you like to stand out in the rain and snow with a wet coat? We believe that all animals should have a house, and our donkeys love to spend time in theirs. We feed our donkeys a good quality grass hay twice a day, lactating moms and foals get an equine grain mixture every day. We also give them carrots, apples etc. Just be careful not to over feed them, because they may get overweight. Fat is stored in the neck and rump. Worming-Every 3-4 months with any equine wormer. Hoof Care-Every 3-4 months hooves should be trimmed. Mineral/Salt Supplement-Consult vet for what is needed in your area.